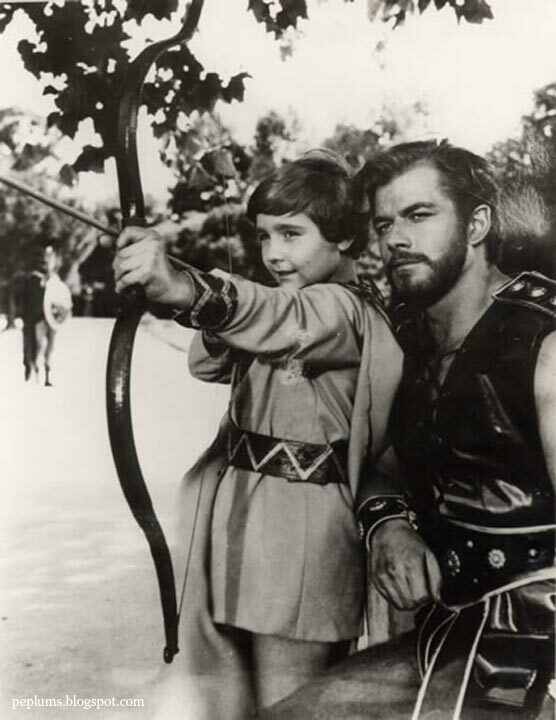 Richard Harrison shows Edoardo Nevola how to shot an arrow in THE INVINCIBLE GLADIATOR. This is one of the best PEPLUM films ever: tons of action, tight story, good acting, believable story. I played this film this past weekend and I watched it from beginning and never get tired of it. Several Richard's PEP films are truly great and yet he and his films are constantly overlooked with many dismissing (and still dismissing?) Harrison as the actor Italian producers hired when they couldn't get Gordon Scott or Steve Reeves. I disagree. And this film and several others of his prove they're wrong. I agree with you, RICHARD HARRISON made a lot of real good movies. I like INVINCIBLE GLADIATOR very much. My top picks are GIANTS OF ROME, and TWO GLADIATORS. His movies are never boring and how can you forget his trademark as being the left-handed swordsman. He also had a long career after the PEPLUM ERA. PERSEUS THE INVINCIBLE, aka Medusa vs Son of Hercules, is also one of his best.